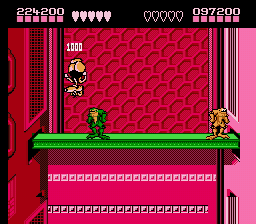 NES Battletoads (USA) "warps, 2 players" in 15:29.03 by nesrocks. This is a two-player timeattack on this game that is said to be quite hard. The movie is a 3:50 improvement to the previous version that was played by Phil and Genisto. Note that the second player dies at some point because of a bug in the game: the beta testers probably never got that far in the game with two players. Thanks to "Cyntalan Maelstrom" for this information. Graphically this game features some really nice scenes - some of which are hopelessly blurred by the mpeg4-compression in AVI.